Winning Bid Classic © 200? WMS Gaming. Players are already 'SOLD!' on the "Winning Bid" slot game, but expect the bids to start increasing with Winning Bid Classic! Game play mirrors that of the original 5-reel video slot featuring the theme of a humorous live auction, but graphics and sound are greatly enhanced for an even more enjoyable playing experience! When three or more gavel symbols land on an active pay line, a garage sale scene appears. The player selects an auction item by touching it, and an assembled group of bidders appears on the screen. 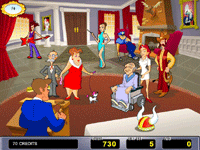 The player can start the bidding by touching one of the characters on screen. A glamorous actress, a rowdy rock star, and a wealthy couple are among the colorful cast of bidders. The bidding continues as different characters raise the bids and make entertaining remarks. The auctioneer calls out 'Going once!' and pauses. A higher bid means the auction continues, if not he calls, 'Going twice, last chance!' and finally concludes with 'SOLD!' The player then collects the bonus award that is the final bid amount in credits multiplied by the player's line bet.